After making my 1st easel card I decided to try a mini sized one too. I created this ACT size. 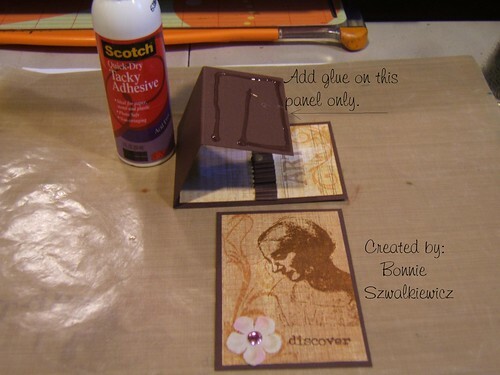 I used DSP (decorative scrapbook papers) to decorate and attach to the base I prepared. Here is how it looked before it was assembled. 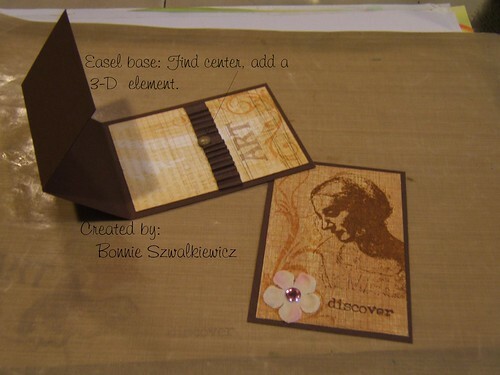 You will need to find the center of the easel base on the un-scored portion. 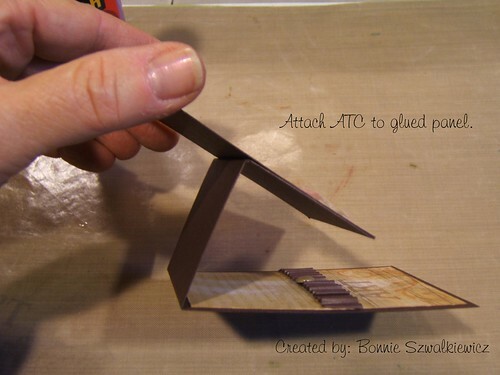 Here you will add a brad or something 3-d that the ATC can lean on to stay in a standing position once completed. I found the center of the easel base and pierced a hole there so I could find it again as I was gluing layers. Then I added a piece of corrugated Chocolate Chip card stock and added a Carmel brad in the center point. In this photo I have added glue to the only panel that will need it. Now I’ve attached the ATC to the easel. I lined up the bottom of the card with the bottom edge of the base I’m gluing it too. 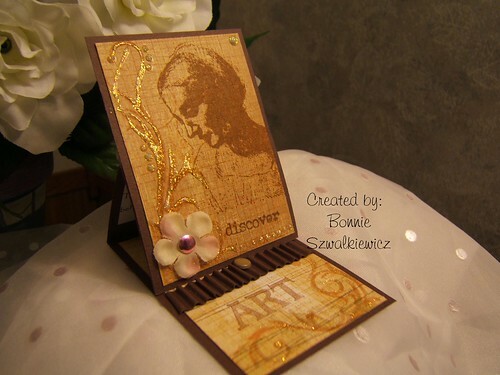 And the finished ATC Easel. I used Chocolate Chip (Stampin Up) for the base and ACT mat; Basic Gray for the DSP. 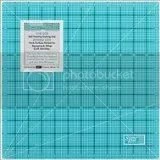 Stamps: Flourish & background grid by Hero Arts; Woman, Art by Time to Stamp and discover by The Angel Company. As a final touch, I added some glitter glue on each of the flourishes. 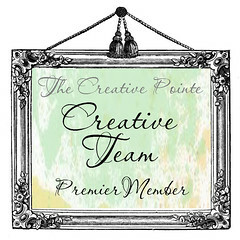 Need an A-2 Size Easel Card? Scroll down past the finished sample and the template is at the end. This is just beautiful and I love the idea of turning it into an easel. Thank you so much for sharing this tutorial with us. Actually, thank you for taking the time to share all your ideas. I think you are super. Have a great weekend. Stunning card Bonnie! Love the way you used the stamps, it´s brilliant. Many thanks for the tutorial! 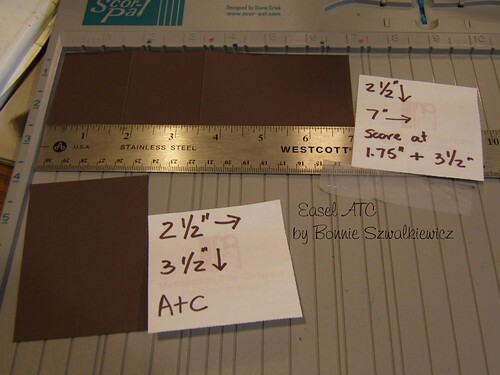 Great ATC, I belong to an ATC club and will have give this a try. Love the idea thanks for sharing and tutorial. I remember making these a while back – they are so much fun!